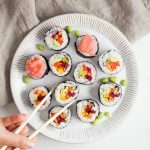 Somehow it has been almost 3 years since we started So Vegan and we’ve only just shared our first sushi recipe. Sushi was always something we never assumed we could make at home. It always seemed fussy and time-consuming, but this recipe is super easy, fresh, vibrant and tons of fun. 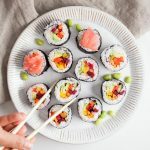 All you’ll need is a sushi rolling mat (you’ll find these on Amazon or almost every Asian supermarket) and some nimble fingers. Lots of sushi recipes use a lot of rice. Our version uses just enough to wrap around the nori so we can pack in more delicious veggies. You still get that lovely sweet flavoured rice, but it also comes with a refreshing crunch. Thoroughly rinse and drain the rice under cold water 3 times, then add it to a saucepan with 330ml (11.2 fl.oz) of cold water. Bring to the boil, then cover with a lid and simmer for 10 minutes. Remove the pan from the heat and leave it to sit with the lid on for 25 minutes. Remove lid from the rice and transfer to a large mixing bowl, then stir in the rice vinegar, sugar and salt. Then leave the rice to cool completely. Meanwhile, peel the beetroot and avocado, then julienne all of the vegetables (slice them thinly). Now it’s time to construct the sushi. First pour cold water into a small bowl and leave the bowl to one side. Place a sheet of nori on top of a sushi rolling mat (rough side up and smooth side down), then wet your fingers in the cold water and use your hands to transfer 1/3 of the rice on top of the nori. Carefully spread the rice out evenly on top of the nori, leaving a 2-3 cm (1 inch) space at the top. Place 1/3 of each vegetable on top of the rice along one row, approximately 1/4 of the way up the nori. Then pick up the bottom end of the sushi mat and tightly roll the nori. 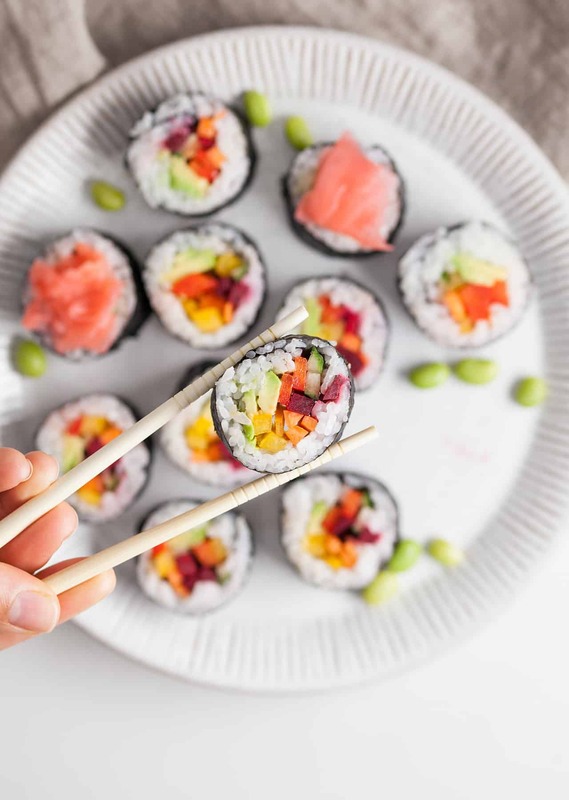 Transfer the sushi roll to a chopping board and use a sharp bread knife to slice into rolls approximately 2cm (2/3 inch) in width. 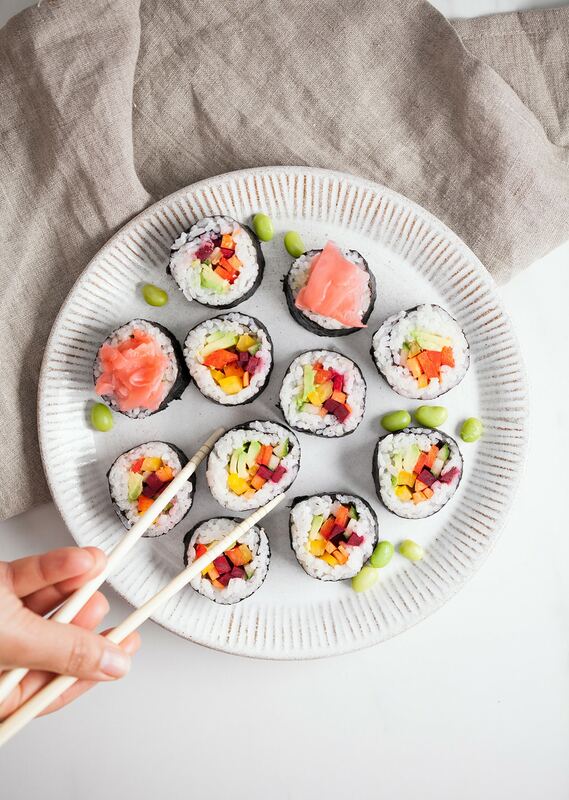 Serve the sushi rolls on a plate alongside the soy sauce wasabi and pickled ginger. Yum!